Nowadays, if we need to take medicine, we buy pills and tablets or a liquid that we measure out by the spoonful. In the past there was not a huge industry that produced medicines in this form so they had to be taken another way. Medicines were administered in liquid form, but in drops, not by the spoonful. Therefore, equipment was needed that could measure very small amounts. The minim measure shown here, which dates from the early 20th century, is a piece of equipment for doing just that. The measure itself comes carefully packaged. 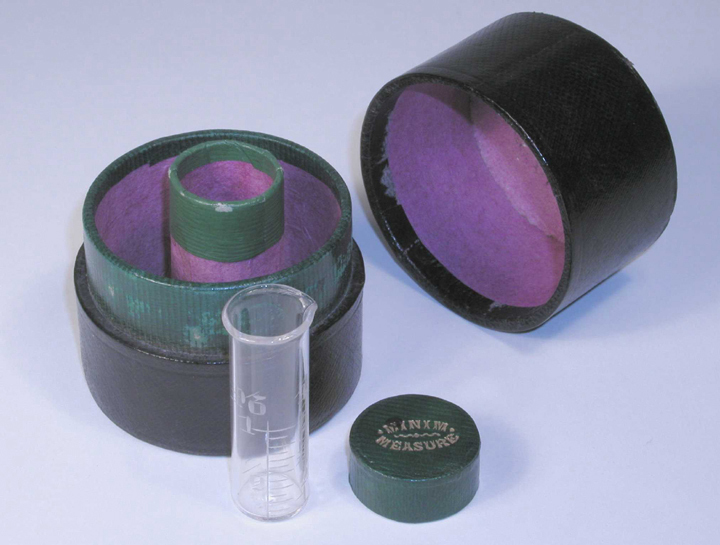 It sits in a little tube that is fixed inside a larger circular box. This way the fragile little glass measure can be protected. The measure itself is a very small glass phial, which has measurements on the side in minims. A minim is an old measuring quantity that is equal to a drop. If the apothecary told you to take two drops, you would measure out two minims. To be strictly accurate, a minim is equal to 1/16th of a fluid drachm and a fluid drachm is equal to 1/8th of an ounce, in apothecaries weight. You can see why it is much easier to measure things out in drops!